Alvin and the Chipmunks: Chipwrecked is a 2011 American live action/computer animated musical family comedy adventure film directed by Mike Mitchell. It is the third live action/animated film starring Alvin and the Chipmunks following the 2009 film Alvin and the Chipmunks: The Squeakquel, which was a sequel to the 2007 film Alvin and the Chipmunks. The film stars Justin Long, Matthew Gray Gubler, Jesse McCartney, Christina Applegate, Anna Faris, Amy Poehler, Jenny Slate, David Cross and Jason Lee. It was distributed by 20th Century Fox and produced by Fox 2000 Pictures, Regency Enterprises and Bagdasarian Company. The film was released on December 16, 2011 and grossed $343 million on a $80 million budget. A fourth live action/animated film, Alvin and the Chipmunks: The Road Chip, was released on December 18, 2015. Dave, The Chipmunks, and The Chipettes go on a vacation on a cruise ship. The Chipmunks and the Chipettes, especially Alvin, end up creating pandemonium. Later that night, after Dave leaves to eat at the captain's table and apologize for Alvin's behavior, Alvin sneaks out to the ship's casino, followed by Simon, who hopes to keep Alvin out of further exposure; meanwhile the Chipettes go to the ship's dance club, leaving Theodore alone in the room, watching an unsuitable monster movie. Dave discovers that his old boss, Ian Hawke, is working as the ship's safety monitor dressed as a pelican, and is out to inform the captain if the Chipmunks and Chipettes cause more problems. Simon and Alvin are eventually caught in the casino, and are brought back to the room, along with the Chipettes, and all are accused by Dave for not being trustworthy. The next day, Alvin goes para-sailing on a kite, but the kite flies away with him and the other Chipmunks. Dave goes on a hang-glider to find them, but Ian attempts to stop him, and they both end up in the Pacific Ocean. Meanwhile, the Chipmunks find an island, and they sleep for the night. Dave enlists Ian's help to find the same island and begin looking for the Chipmunks. The next morning, the Chipmunks go and find food, and while they do so, an island castaway named Zoe shows up and sees the Chipmunks and Chipettes for the first time. They then go to Zoe's tree house, where Eleanor sprains her ankle after falling off a zip line, and Simon gets bitten by a spider, the side effects including personality changes and loss of inhibition. The morning after, everyone observes Simon's personality has changed, and he has no memory of being Simon; he also thinks he is a French adventurous chipmunk named Simone. "Simone" becomes attracted to Jeanette and falls in love with her, but does not take as kindly to Alvin and Brittany. Later, Zoe takes Simone, Jeanette, Eleanor, and Theodore to a lake with a waterfall, and Simone finds a cave. He returns with a gold bracelet which he gives to Jeanette as a crown. Brittany and Alvin, having become the "responsible" ones, see an active volcano the next day, and they decide that they have to leave the island with the others. Theodore and "Simone" find Dave and Ian, and they go to meet with the other chipmunks. With Alvin and Brittany in charge, they are all assigned jobs to build a raft to leave the island. When Jeanette and "Simone" go and look for food, "Simone" is knocked unconscious, and Jeanette is kidnapped; "Simone" reverts to Simon afterward. Everyone finds Simon awake, and he cannot remember anything since the change. They discover that Zoe has taken Jeanette, and they head towards the waterfall. When they approach the tree log to cross, Dave and Alvin decide that they will go and find Jeanette. As Zoe encourages Jeanette to find the treasure in the cave by tying her to a rope, Alvin and Dave come to her rescue. The island begins to rumble again, as Zoe lets go of the rope, and Jeanette runs with Dave and Alvin back to the raft, but is pulled back at the log bridge. Simon swings in to help Jeanette before Alvin can cut the ropes with a Swiss Army Knife. Dave is left hanging from the log when it almost gives away. Alvin and Ian convince Zoe to help save Dave. They then run towards the raft and escape the eruption. While on the raft, Zoe apologizes to Jeanette for kidnapping her and forcing her to retrieve the treasure. As a gift, Jeanette gives Zoe the gold bracelet that Simon had given to her. Alvin reconciles with Dave, and they are rescued. The Chipmunks and Chipettes perform at the International Music Awards. Ian also starts a new career as a screenwriter by selling a screenplay about Zoe's story to Hollywood, earning him his wealth back. In a post-credits scene, the Chipmunks, the Chipettes, and Dave are on a plane heading back home. Alvin is speaking on the pilot's microphone and tricks the passengers into thinking that the aircraft's destination is Timbuktu. Meanwhile, a stewardess keeps instructing Dave to sit down as the plane is about to take off. Alvin accidentally pushes the food cart, which hits Dave, leading to him doing the catchphrase. Alan Tudyk as "Simone", Simon's French alter ego after being bitten by a spider when he causes split personality. On October 26, 2010, according to 24 Frames from the Los Angeles Times, Mike Mitchell, the director behind Shrek Forever After, was in negotiations with Fox to direct the new film. The film featured one of Carnival's newest and biggest cruise ships, Carnival Dream. The external shots and interior stateroom suite were filmed during a 7-day Caribbean cruise. The casino, dance club, and dining room were filmed on a set not attempting to match the actual interior of the Carnival Dream cruise ship. 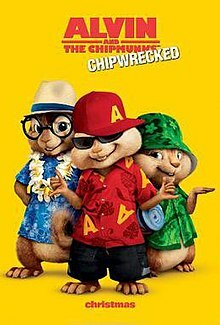 Alvin and the Chipmunks: Chipwrecked was released in the U.S. on December 16, 2011, and was the first and only live-action/CGI Chipmunks film to be rated G by the MPAA. Alvin and the Chipmunks: Chipwrecked was released on DVD and Blu-ray on March 27, 2012 from 20th Century Fox Home Entertainment. The film grossed a total of $133,110,742 in North America, and another $209,584,693 overseas, for a total worldwide gross of $342,695,435. Alvin and the Chipmunks: Chipwrecked made $6.7 million on its opening day, which was lower than the opening day grosses of the original film ($13.3 million) and its sequel ($18.8 million). For its opening weekend, the film ranked at the #2 spot behind Sherlock Holmes: A Game of Shadows with $23.2 million, which was less than the opening weekends of the franchise's previous two films, the original film's $44.3 million and its sequel's $48.9 million respectively. On Rotten Tomatoes, a review aggregator, the film has an approval rating of 11% based on 78 reviews and an average rating of 3.5/10. The site's critical consensus reads, "Lazy, rote, and grating, Chipwrecked is lowest-common-denominator family entertainment that's strictly for the very, very, very young at heart." On Metacritic, the film has a score of 24 out of 100 based on 19 critics, indicating "generally unfavorable reviews". Audiences polled by CinemaScore gave the film an average grade of "B+" on an A+ to F scale. Alvin and the Chipmunks: Chipwrecked: Music from the Motion Picture is the licensed soundtrack based on the film. It was released on November 15, 2011 by Atlantic Records. Released to US Target stores, a limited edition version of the soundtrack was released containing four exclusive bonus tracks. iTunes and Amazon.com released a deluxe edition available only on digital download containing three bonus tracks. Alvin and the Chipmunks: Chipwrecked is a video game based on the film. It was released for the Wii, Nintendo DS, and Xbox 360 on November 15, 2011 in North America and on November 25, 2011 in Europe. Like the previous "Alvin & The Chipmunks" and "Squeakquel" video game adaptations, Ross Bagdasarian, Jr. and Janice Karman reprised their respective roles. Jason Lee and David Cross reprise their roles as well. It follows the plot of the movie. The Chipmunks and Chipettes get washed up on an island. It's up to the player to play as the Chipmunks, Chipettes, Dave, or Ian to get back to the city. In June 2013, 20th Century Fox announced that a sequel, Alvin and the Chipmunks: The Road Chip, would be released on December 11, 2015. On December 18, 2014 however, it was announced for a December 23, 2015 release. On October 14, 2015, the release date was pushed forward to December 18, 2015. ^ Lussier, Germain (June 16, 2011). "'Alvin and the Chipmunks 3: Chipwrecked' Teaser Trailer". Slash Film. Retrieved October 9, 2011. ^ "ALVIN AND THE CHIPMUNKS - CHIPWRECKED". bbfc.co.uk. ^ Kaufman, Amy; Fritz, Ben (December 15, 2011). "Movie Projector: 'Sherlock,' 'Alvin' sequels kick off holiday season". Los Angeles Times. Tribune Company. Retrieved December 15, 2011. ^ a b "Alvin and the Chipmunks: Chipwrecked (2011) - Box Office Mojo". boxofficemojo.com. ^ a b Kit, Borys (December 18, 2014). "'Alvin and the Chipmunks 4' Finds a Director (Exclusive)". The Hollywood Reporter. Retrieved December 18, 2014. ^ Zeitchik, Steven (October 26, 2010). "Alvin and the Chipmunks closes in on its ringleader". Los Angeles Times. Retrieved October 9, 2011. ^ Casey Broadwater. "Alvin and the Chipmunks 3: Chipwrecked Blu-ray". Blu-ray.com. ^ "Friday Report: 'Sherlock,' 'Alvin' Stumble, 'M:I' Dominant in IMAX". boxofficemojo.com. ^ "Weekend Report: Disappointing Debuts From 'Sherlock,' 'Alvin' Sequels". boxofficemojo.com. ^ "Alvin and the Chipmunks: Chipwrecked". rottentomatoes.com. 16 December 2011. ^ "Alvin and the Cjipmunks: Chipwrecked Reviews". Metacritic. Retrieved 19 February 2017. ^ "'Kids Choice Awards': And the winners are..." Entertainment Weekly's EW.com. ^ Philiana Ng. "Teen Choice Awards 2012: 'Breaking Dawn,' 'Snow White' Lead Second Wave of Nominees". The Hollywood Reporter. ^ a b "Various Artists - Alvin & The Chipmunks: Chipwrecked - Amazon.com Music". amazon.com. Liner notes credit the song as "Whip My Hair" NOT "Whip My Tail". Liner notes credit the song as "The Chipettes" NOT "The Chipmunks & The Chipettes". ^ "Various Artists - Alvin and the Chipmunks: Chipwrecked - Amazon.com Music". amazon.com. ^ "Amazon.com: Chipwrecked (Music From The Motion Picture) [Deluxe] [+Digital Booklet]: Alvin And The Chipmunks: MP3 Downloads". amazon.com. ^ "Chipwrecked (Music from the Motion Picture) [Deluxe Version]". iTunes. ^ Lussier, Germain (June 11, 2013). "Fox Dates 'Frankenstein,' 'Alvin and the Chipmunks 4′ and Animated Films Through 2018". /Film. Retrieved October 19, 2013. Wikimedia Commons has media related to Alvin and the Chipmunks: Chipwrecked.